The unbelievable gift of the healing professions is that it allows one to partake in the journey of healthcare. I am once again on a journey, but this time returning to Sydney from a very brief and intense visit to Wellington, New Zealand. I have, over the last few years, had a number of patients from Wellington come to Sydney and have been meaning to see if I can conduct workshop on spine deformity in Wellington to encourage a Wellington-based physio to embark on the rigorous, exhausting, challenging but oh so agonising and somehow rewarding journey to become a competent spine deformity physio. Thank you to physiotherapists Dr. Ben Darlow and Helen McKendrey of Capital Sports Medicine for hosting the workshop. I also took the opportunity to review some very special patients whose care I am in involved with. When we commence these treatment processes we aim for certain outcomes whilst recognising that sometimes we cannot hold these curves and they continue to progress DESPITE good bracing, good therapy, good adherence and good intentions. The surgeons want evidence of efficacy and we read scientific papers looking to support different treatment interventions. My SOSORT sponsored Harvard course taught me to critically analyse the literature, to find the holes in the research, to find gaps in the scientific method and to look at the data with a scientific and critical eye. The problem with the literature of today is that there are no names. The patients are grouped together and described as a sample size of 50 or 100 with a mean age of 12 or 14 with a mean Cobb angle curve of 30 degrees or 50 degrees but that’s not the complete story. My patients have names, they have hopes and fears and emotions of relief and despair. They have families who commit and expend and invest and yearn and endure along the journey. And then if the curve continues to progress, they question. They question the past, they question the present and they question the future. They don’t teach you this in physio school, they don’t teach you this in Schroth school. 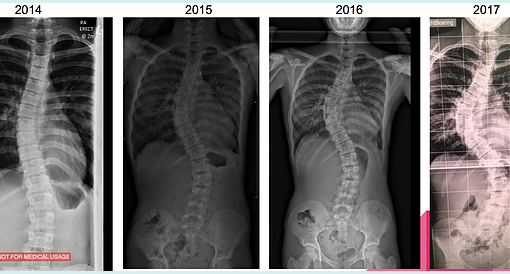 Dr. Rigo in Barcelona once said that the principles and mechanics of spine deformity treatment can be taught but only time allows one to learn. How much time, the time it takes to establish that, despite everything, curves progress and surgery is eventually inevitable and essential. I get it, I get the fear, concern, worry, and doubt. From profoundly devastating personal experience I get it. Alas, I offer strength and support and confidence and belief that everything works out fine. These kids, on this journey, with their families, will be fine. Katharina Schroth had a name for the typical thoracic rib hump that accompanies most scoliotics through life. She called it a “Paket” and expected her patients to call it that too. Paket in German means “package”. These kids and their families carry their package and sometimes get help from physios and sometimes get help from surgeons. And eventually…. everything works out fine. Let’s hope a Wellington-based physio takes their first step. It’s a long journey!